Please Note: It is absolutely essential that you physically measure your lighting equipment and check your dimensions against the inside dimensions listed here to avoid any errors. This lighting LED ATA case is constructed of 1/4 inch plywood with black nubtex laminate surrounded in aluminum extrusion and permanently machine split riveted together. It is then finished with steel flat corners, 4 spring loaded recessed catches and 2 spring loaded recessed handles with rubber grips for easy transporting. All hardware is plated for protection against erosion and weather. The interior of this case is completely poly foamed lined. The Corru- Cube dividers are made of single wall corrugated board sheets with 1/8 inch thick poly foam on one side. These sheets are then scored and formed into a 4 sided individual square compartments and taped together at the seam. These cubes are sized perfectly for the interior dimensions of your case. These dividers are not attached to the walls of the case but by placing these individual cubes into the case they hold each other firmly together. This is an effective way of dividing your lights with an economical light duty material. 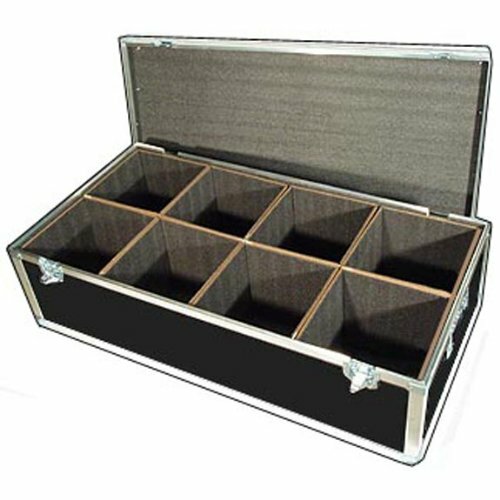 This case is a low cost alternative to expensive ATA cases and provides reliable protection for your lighting equipment.